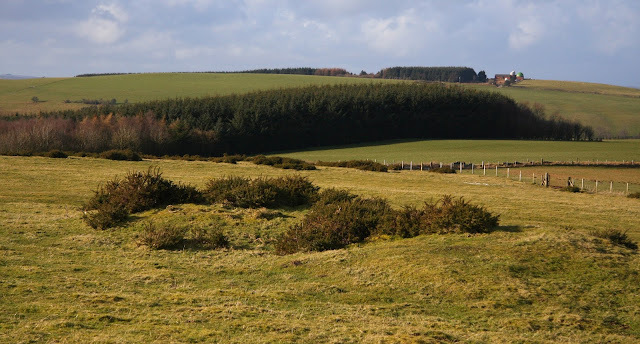 There is a certain form of fulfilment when de-twinning twinned tops, these are the hills that according to map spot heights have summits of the same height and are adjoined to one another via a direct connecting bwlch. Farrington Bank is such an example as it has two summits, both of which are given a 417m spot height on the Ordnance Survey 1:25,000 Explorer map. They are aligned north-east to south-west of one another, with a conifer plantation between. 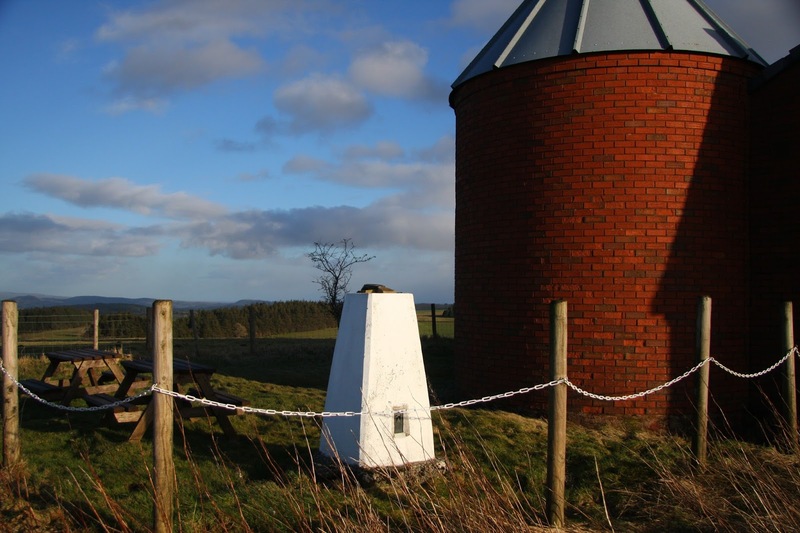 The north-east summit is crowned by a trig point given a 416.960m flush bracket height in the OS Trig Database and which is situated at the back of buildings that accommodate The Spaceguard Centre which is an observatory giving itself the moniker of The National Near Earth Objects Information Centre, whilst the 417m south-westerly summit is positioned in a closely cropped grazing field. With an appointment to meet friends in Newtown at 6.00pm and wanting to survey the critical col of The Warren after these two tops I could not linger, so I drove up the partly rough track that leads to the observatory and parked on the grass beside the continuation of the track which gives access to the centre’s car parking area. Leaving the car the chilled wind blew from the west, from where masses of dark winter shower clouds had, and were still, rolling in depositing sleet, snow and rain as they did so. I’d been fortunate during the day and only experienced one snow flurry but the one now massing looked to be the largest of the day so I quickly walked toward the large field where the summit of the south-west top is situated. 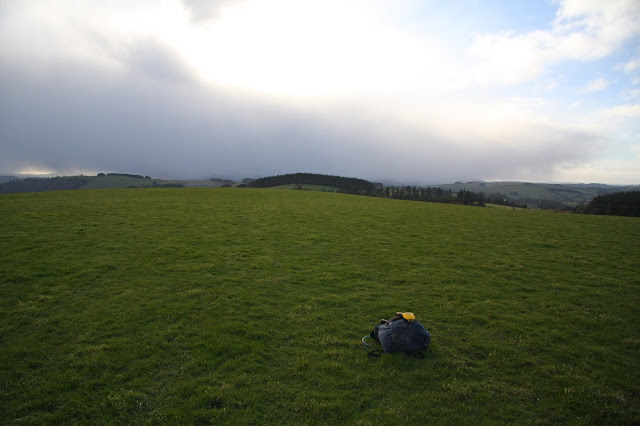 I placed my rucksack where my initial preference was for the high point and quickly assembled the Trimble on top, measured the offset between its internal antenna and the ground at its base and waited for five minutes of data to be gathered and stored. During this I had time to assess the placement and decided to take a second data set a few metres from its present position. As I gathered this second data set the mass of murk forever pushed nearer and by the time I had closed the equipment down the sun had disappeared and the edge of murk was directly above, I quickly packed the Trimble away and headed back to the track and up to the observatory. 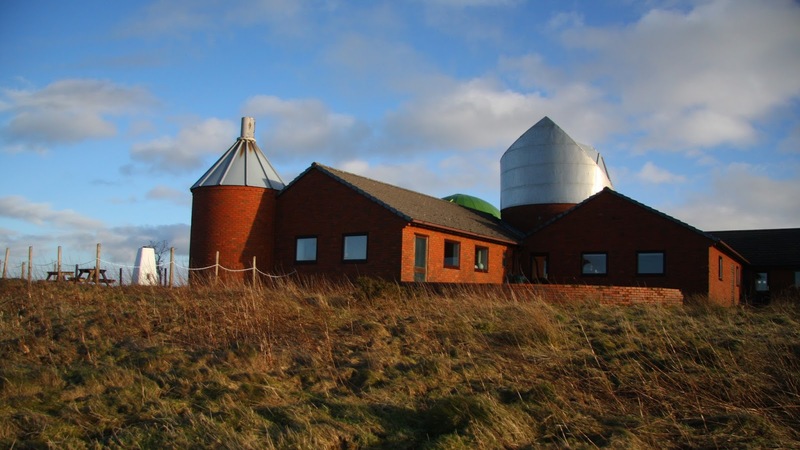 As I walked up the access track a number of people were leaving the building, they had just had a conducted tour of the observatory, so I knocked on the door, introduced myself and asked if I could visit the trig pillar at the rear of the buildings and explained what I wanted to do. The woman who worked at the observatory seemed pleasantly surprised that I had asked and thanked me for doing so, we chatted for a few minutes in the warmth of the building before I ventured out to have a look at the land beside the trig. The trig pillar is placed close to the side of one of the buildings and is housed in a small fenced compound that also has two picnic benches with accompanying seats. I judged the high point of this summit was at or near to the base of the trig pillar and set the Trimble up on its top. Thankfully it only took a couple of minutes for the Trimble to attain the 0.1m accuracy level before data should be logged, and when it did so I pressed ‘Log’ and scampered behind the side of one of the buildings out of sight of the surveying equipment and on the leeward side of the snow flurry that was now skimming across the land. Once five minutes of data were collected I switched the Trimble off and headed back to the entrance door to express my thanks to the woman from the observatory before walking down the track to my car, only one survey for the day now remained; the col of The Warren.